The bus left from Caceres to go to Telavera de la Reina at 6 a.m. I slept for the entire 3 hours (except for 15 minutes at a random stop where they made us all get out) until we reached Telavera around 8:40 a.m. as expected. I tried in vain to find the ticket counter for the 9 a.m. bus to Toledo but I finally ended up asking someone at the counter. After a few miscommunications, I understood that I needed to buy a ticket directly from the driver. I ran down and made it onto the bus about 2 minutes before nine. I fell asleep again and reached Toledo in about an hour. Toledo is located up on a hill and surrounded on 3 sides by water. Getting from the bus station to my hotel would be a 20 minute uphill climb. 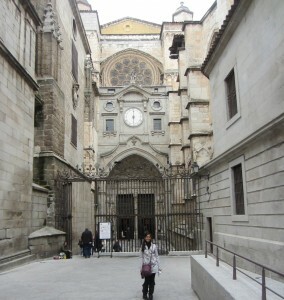 I then headed to the Cathedral in Toledo. 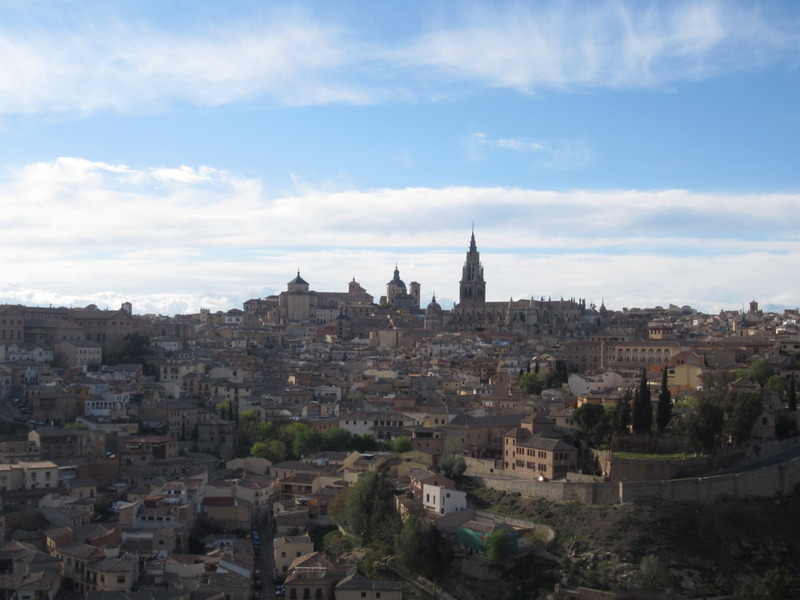 Toledo used to be the Capital of Spain, and is still the religious capital of Spain. I've seen either a church or cathedral in every place I've visited but they didn't hold a candle to the one in Toledo. It was amazing and overpowering. It's supposed to be one of the best Cathedrals in Europe and I agree. It's a mixture of Gothic, Renaissance, Baroque and Neoclassical architecture. There are so many stained glass windows as well! My favorite part was called the "transparente," a cupola in the ceiling with intricate paintings and that lets in light to shine on the Virgin Mary. I also saw a many pieces of art by artists such as El Greco, Goya, Bellini and Rubens, just to name a few. After about 2 1/2 hours at the cathedral, I headed to the Santa Cruz Museum where I saw more paintings by Greco (I'm not really a big fan), some pottery, and some other art as well. For being one of Toledo's main sights, I thought it was okay. But this may be because Greco is very famous/renowned in Spain and I'm just not really into his style of dark colors, elongated bodies, and emphasis on a "supernatural" quality to his paintings. Around 18:45 I went to buy a ticket for the tourist train which goes around Toledo. It was a very enjoyable 45 minute ride with great views of the city. It's really interesting how Toledo is bound on three sides by water and sits atop a hill. It made attacking it quite difficult because the river forms a natural moat and the only side facing land had (and has) a city wall for protection. After getting off the train, I went on a walk just to look around before heading to Santa Tome, a Mazapan producer. Mazapan is the speciality desert from Toledo which has different variations such as plain, with filling, fruit, chocolate dipped, etc. I wanted to try a couple different types and I bought 5 pieces from the store. 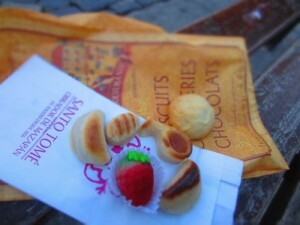 I then headed to the Plaza del Ayuntamiento to try them while enjoying a spectacular view of the Cathedral. The different types of mazapans I tried were delicious, but they were also kind of giving me a stomach ache at the same time because it was so much sugar. I decided to take a walk around the main part of the city because it has such a medieval feel to it. Actually, Toledo is famous for it's swords and knifes, and any movie you've watched that involved swords (like Lord of the Rings) probably were made in Toledo. After a nice walk, I headed back to the hotel and called it a night. The next morning, my first stop was Santo Tome, a chapel which houses one of the most famous paintings by El Greco in it's original place. I know I'm not a big fan of Greco, but this one I actually liked, probably because it had so many different elements to it. It is called " The Burial of Count Orgaz." I spent about 20 minutes just looking and taking in the painting before heading further down to the Museo of Victorio Mancho, a famous sculptor from Spain. His home while he lived in Toledo is used as part of the museum and some of his pictures and paintings gave me the chills. I really liked his work. In addition, there were great views of the river from the balcony. It was a nice change from all the historical sights I had been seeing. I decided it would be a good time to eat and grabbed a bocadillo (a sandwich) with eggs, peppers, cheese, and mayonnaise. I don't know how they prepare the peppers in Spain, but as always, it was yummy. snoozing in Granada instead. The front of the Monastery has a bunch of chains attached to the wall brought over from Granada. These chains were used by Moors to shackle Christians and serve as a symbol of their Catholic Faith. Celebrating Isabel's acquisition of Castile, it is filled with propaganda of the royals. Coat of arms, repeating initials, and as always, some Moor influence. There was also a very nice courtyard with a garden that was nice to walk around (you can't walk through it because it's a symbol of the Virgin Mary's purity). I was very close to the river by this point so I decided to walk around the Cameron Bridge just for kicks. As I was walking, I noticed a set of stairs going down and curiosity got the better of me. I was starting to walk down when a very elderly looking woman sitting on a ledge next to the stairs asks me where I'm going. Caught unaware, I managed to stutter out that I was heading towards the river. She started asking me more questions so I sat down besides her and we started talking. It turned into a 30 minute conversation where she told me all about her life, her kids, grand kids, the economy of Spain, Toledo, and the Spanish civil war. She only stopped talking when she realized it was time for her to go to Church. I'm actually pretty proud of myself for being able to understand her and converse with her! I continued on to the bridge, walked across, walked back, and started heading back towards the Southwest part of town. I stopped at the Sinagoga del Transito, Spain's national Jewish Museum (Sefardi). It is also another example of tolerance between Christianity, Jews, and Muslims. It was quite beautiful as well. That was my last stop before heading back to hotel to gather my stuff and walk to the bus station, a downhill walk this time! Enjoy the Spanish lifestyle while improving your English teaching skills! As a volunteer home tutor or teaching assistant, you'll live with a welcoming host family, teach English, and experience Spain as a local. It’s a great way to explore the teaching profession and gain insight into Spanish culture. No Spanish language skills required!